Stocks rallied in Asia and Europe, U.S. equity index futures advanced and the dollar weakened after American jobs data cooled speculation that the Federal Reserve will raise interest rates this month. The Stoxx Europe 600 Index climbed to an eight-month high and the MSCI Asia Pacific Index jumped by the most in four weeks as the dollar fell versus all of its major peers. The yen strengthened after the head of Japan’s central bank refrained from detailing any new initiatives that may be used to stoke inflation. Oil climbed toward $45 a barrel, reversing earlier declines. Financial markets in Canada, India and the U.S. are shut on Monday for holidays. While Friday’s U.S. payrolls data showed hiring moderated more than economists forecast in August, the estimate of the number of jobs added in July was revised higher and financial markets continue to reflect a significant risk of a September interest-rate increase. The chance of the Fed hiking borrowing costs this month ended last week at 32 percent, futures show, having been 34 percent on Thursday. The probability fell briefly to 20 percent in the wake of the jobs report. “The disappointing August nonfarm payrolls report essentially reduced the risk or delayed a September Fed funds rate hike,” said Elias Haddad, a senior currency strategist at Commonwealth Bank of Australia in Sydney. “That usually supports the risky assets” such as higher-yielding currencies, he said. China’s services output picked up in August, data showed Monday, and a comparable gauge for the euro area is also forecast to show improvement. Bank of Japan Governor Haruhiko Kuroda ruled out cutting monetary stimulus in a speech he gave in Tokyo and reiterated that there’s scope for policy to be loosened further if needed. Leaders of the Group of 20 nations are attending an annual summit, which is being held this time in Hangzhou, China. The Stoxx Europe 600 Index was up 0.2 percent as of 8:26 a.m. London time, after a 2 percent jump in the last session that marked its best performance since June. About three stocks rose on the benchmark for every one that declined. The MSCI Asia Pacific Index added 1.3 percent, headed for its highest close in a year. The Hang Seng Index led gains in the region after data showed home sales in the city climbed to a 14-month high in August. The Stock Exchange of Thailand Index fell 1.4 percent following an update on the health of the nation’s 88-year-old king, who has been a source of political stability throughout his reign. 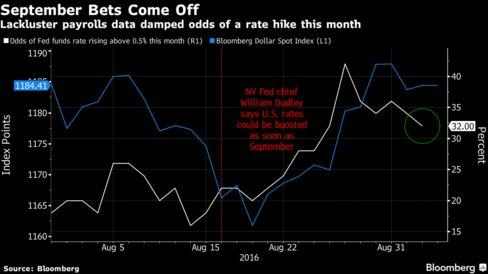 The Bloomberg Dollar Spot Index, a gauge of the greenback against 10 major peers, fell 0.3 percent. The measure slid as much as 0.5 percent on Friday following the release of the payrolls data, before erasing its decline as investors weighed the significance of the revised July figures. New Zealand’s dollar, which offers the highest yield among Group of 10 currencies, strengthened 0.6 percent and Australia’s dollar rose 0.4 percent. South Korea’s won led gains in Asia with a 1.1 percent advance. Japan’s yen was up 0.6 percent, after sliding 2 percent last week. Kuroda said Monday that some policy suggestions can’t be done legally or should not be done, such as directly underwriting government bonds and monetizing fiscal deficits. Crude rose 1.2 percent to $44.96 a barrel in New York, after earlier sliding as much as 0.9 percent. Saudi Arabia and Russia stopped short of offering detailed plans to stabilize oil prices after Deputy Crown Prince Mohammed bin Salman and President Vladimir Putin met in China on Sunday. The price jumped 3 percent on Friday, the most in two weeks, after Putin said he’d like OPEC and Russia to agree to an output freeze. Gold held near its highest level in more than a week, having rallied 0.9 percent on Friday following the payrolls data. Australia’s sovereign bonds due in a decade fell, pushing their yield up by four basis points to a two-week high of 1.90 percent. The nation’s central bank is forecast to keep the benchmark interest rate unchanged at Governor Glenn Stevens’s final policy meeting on Tuesday as policy makers hang on the U.S. Federal Reserve’s next move. Japanese long-term bonds fell, with 30-year debt extending to its biggest weekly loss in more than two years, as investors prepared to bid at an auction of the securities on Tuesday. The rout is being driven by speculation the BOJ will reduce its bond-buying program at its next policy meeting now that it owns a third of the nation’s government debt. Kuroda said Monday he doesn’t share the view there’s a limit to monetary easing.